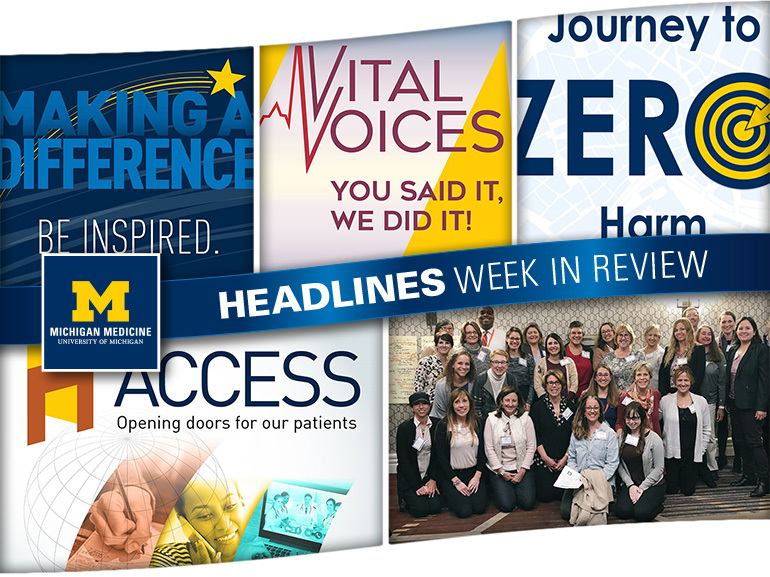 This week, Headlines focused on initiatives aimed at making Michigan Medicine a better place for faculty, staff and patients. For instance, readers were given a closer look at Rewrite the Script, an important event designed to enhance pain management and reduce opioid-related harm at Michigan Medicine. The organization also shared how it is removing roadblocks to boost patient access; employees learned details of projects that will improve the workplace in the wake of the 2018 Employee Engagement Survey; the journey toward high reliability took another critical step forward; and employees were lauded for making a difference for patients and colleagues last month. According to the National Institutes of Health, about 100 million Americans suffer from chronic pain every day. That’s why nearly 200 members of the organization recently came together to discuss how to more effectively help patients manage that pain and reduce harm from opioid use. Click through for details of Rewrite the Script, an event that will have lasting implications at Michigan Medicine! The ultimate goal at Michigan Medicine is to allow patients to see the right provider at the time they need and at the location that is most convenient to them. Click here to learn about steps that are being taken to make sure that such a vision becomes reality for everyone who seeks care within the organization! Earlier this year, employees made their voices heard during the Employee Engagement Survey. In the ensuing months, colleagues took that feedback to heart and began instituting new initiatives and programs to make Michigan Medicine a better place to work. Learn more about these changes and get a sneak peek at others you can expect to see in the future. With the help of Healthcare Performance Improvement, Michigan Medicine is continuing its process of becoming a highly-reliable organization. Last month, HPI met with hundreds of employees and analyzed data in order to make recommendations about how Michigan Medicine can improve its patient safety culture. Check out HPI’s feedback and see the next steps on this important journey.